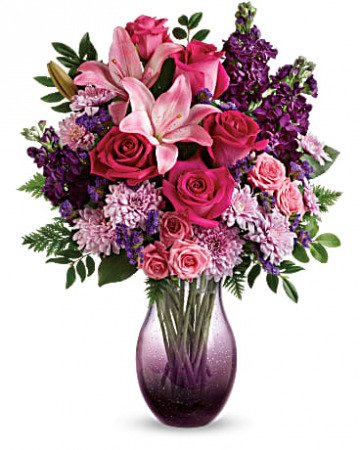 Make an unforgettable impression on her with this dramatic bouquet! She'll forever treasure its hand-blown, one-of-a-kind bubble glass vase, featuring soft ombre shades of purple and plum. Presented by Teleflora. It’s been said that a beautiful garden is a work of “heart”. That’s why we’ve filled our vibrant arrangement with a garden-inspired gathering of fresh roses, Gerbera daisies, spider mums and more. 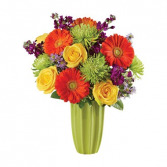 Hand-arranged inside an exclusive green fluted vase with clean lines and a sleek, stylish Art Deco design, this beautiful surprise is sure to touch the heart of someone very special to you. Presented by Bloomnet. 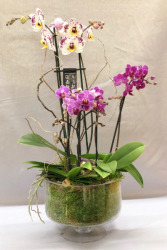 Six stems of orchid plants arranged in a Badash glass Trifle Bowl surrounded by moss with stones, curly willow and a bird pick adorn this beautiful enchantment of outdoor splendor brought indoors. Arranged on site by one of our designers, this is a perfect gift to let someone special know you are thinking of them.